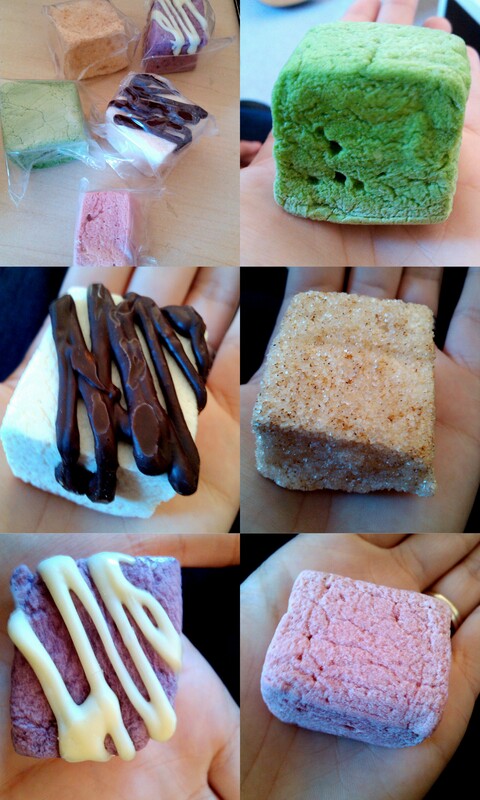 We received a package of gourmet marshmallows from Fluffy Puff Puffs to review for our blog. Thank you! Fluffy Puff Puffs is the brain child of Louisa who creates artisan marshmallows in a variety of flavours which are never found in most supermarkets or shops. As gourmet marshmallows are a growing trend in the UK soft confectionery industry, Louisa would like to see Fluffy Puff Puffs grow into large production facility of the UK’s best gourmet marshmallows. Fluffy Puff Puffs don’t have any nasty preservatives added to their marshmallows, and have a shelf life of 6-8 weeks! Our package arrived and inside were 5 HUGE marshmallows. Seriously, these guys needed multiple bites before they were gone! The airtight packaging meant that our marshmallows were perfectly soft and fluffy. Louisa kindly sent us 5 different types of marshmallows to sample which were (from top, left to right): lime punch, dark chocolate peanut butter drizzle, sugar & spice, love currant & white chocolate and raspberry. We decided to each take a bite out of marshmallows, to decide what our favourite would be! The lime punch, love currant & white chocolate and raspberry marshmallows were packed with fruity flavour. The lime was so zesty, and I was surprised by how much flavour had been packed into them! This is probably because Fluffy Puff Puffs marshmallow’s colour is made from at least 85% of natural resources. I really liked the love currant one as the drizzle of white chocolate on the top off-setted the bitterness of the blackcurrant. I think gourmet marshmallows are a really cute trend. I have been exhausted with cupcakes recently, and think that they have been overdone in some instances, however I can see this gourmet marshmallow trend really catching on. They would make great wedding favours, be a good talking point at corporate events and best of all, I think they could make a beach party or BBQ really fantastic if you got a host of different flavours, skewed them on a stick and then enjoyed them as a sweet treat! Fluffy Puff Puffs have a huge range of marshmallow flavours available, I think the key lime & ginger pie, toasted coconut and love mud pie look fab! 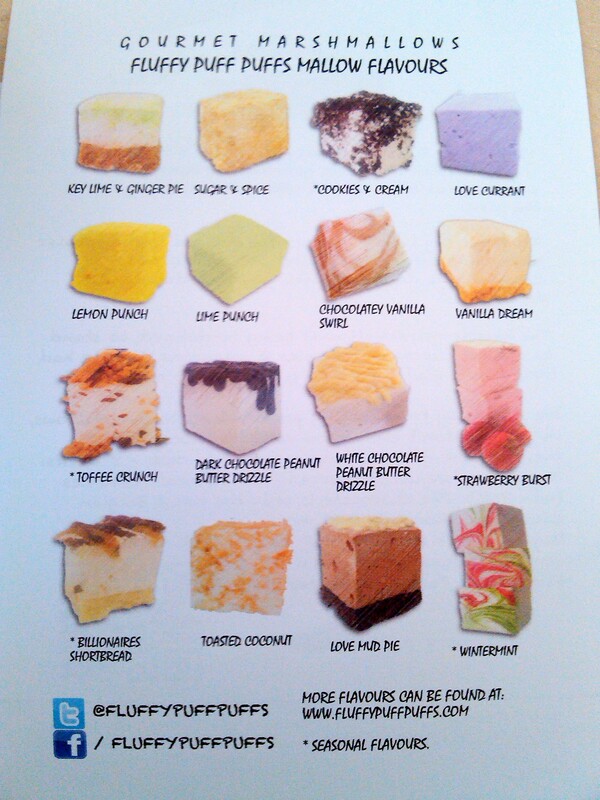 Let us know what flavours you have tried!